Last week, NuCypher released their thoughts on a unique token distribution model called the WorkLock. The aim of the model was to find something that limited speculation as much as possible, kept incentives aligned with the network’s health, works out regulatory uncertainty, and avoids deanonymizing participants by having to implement KYC procedures. After considering both airdrops (which aren’t that effective), and LivePeer’s Merkle Mine, they began outlining a more efficient model. The WorkLock features a means in which participants lock up collateral, in this case, ETH, for tokens. If they decide to use the tokens for their intended purpose, which in the given case is staking nodes, they would receive their escrowed collateral back after working for a certain period of time. If participants don’t use the tokens for their ‘work’ purpose, then the ETH they’ve locked up as their bond is burned. How do we incentivize participants outside of the initial distribution to work as well? How do we ensure that work can continue for longer than an ephemeral period? How do we allow efficient price discovery for the token while bootstrapping the network? Original escrow in place for token distribution similar to the WorkLock. Participants receive 25% of their escrow back after ‘x’ work provided. 75% of ETH is pooled and forms an exogenous block reward which is granted in addition to the network’s native block reward. Any participant (even outside of token distribution participants) have until a particular block height to start working for the network or forfeit the ability to earn the exogenous reward. Through this model, participants have the ability to earn back more than their original escrow, while participants outside of the token distribution event can participate and fight for rewards. Reward starts small, and increase over time until the exogenous reward pool is emptied. Based on NuCypher’s original model, I’m now proposing The WarLock — forcing long-term participation for both a portion of the original escrow, and an even greater reward based on the amount work provided. The model begins with the same base formula: token distribution participants escrow ETH into a smart contract where it is locked, and get tokens for their escrowed capital. 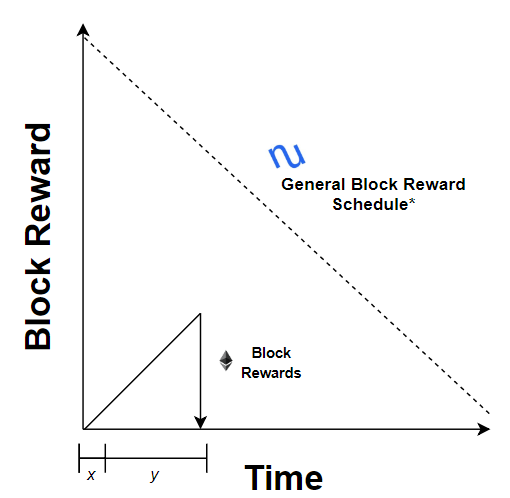 However, instead of the ‘work for ‘x’ time and receive your principal back’ model proposed, the WarLock differs in that any network participant providing work for the network has an opportunity to earn from a newly enforced exogenous block reward. All possible network participants are now at war with token distribution participants (minus a portion of their escrow refunded) to extract all exogenous block rewards, which ends up being a net positive for the network’s decentralization and security. The WarLock begins with participants being allocated a percentage of their escrow by providing the initial ‘x’ time worth of work for the network. In the WarLock, this is 25% of their reward and an initial effort to bootstrap things. This is similar to the base WorkLock model in which participants are given a set period of time to work and get back their escrowed ETH — but in this case, the percentage is reduced, simply as an introductory measure. The remaining 75% of the reward is then pooled with the escrow of all other candidates to act as an exogenous block reward in addition to the current block rewards participants receive from the network in its native token. Network workers will have until a particular block to begin working for the network — if at any time they drop out for a certain period of time, they become ineligible to additionally mine the exogenous reward. If they remain and work, they can receive t tokens along with eˣ block rewards. This also means that external actors that weren’t part of the initial token distribution can also earn these rewards, increasing competition for the pooled ETH. Exogenous rewards begin small, but increase over time for a set period determined by the developers of the network. Network participants that provide enough work can recoup their escrowed ETH with additional ETH that can be earned over time. Also, while this is occurring and the token is “finding its legs” in the market, workers for the network are still earning an asset alongside the network’s token that has already been efficiently priced by the market, only adding to the price of the network’s security at stake. Bootstrap the network with all token distribution participants, and those outside of the initial distribution. Encourage longer work threshold for token distribution participants and avoid quick dropoff once escrowed ETH has been returned. Give token distribution participants the ability to earn more ETH than originally escrowed based on work provided. Add additional known-value based incentives for non-distribution participants. Productive distributions such as NuCypher’s WorkLock shows that there are ways in which tokens can be distributed to participants who will only add to the health of the network. Originally, airdrops provided a means to have a wider distribution at the cost of speculative interests superseding productivity. However, mechanisms like the WorkLock and proposed WarLock are ways in which networks can be bootstrapped with the right participants. The WarLock introduces a new force to keep token distribution participants engaged. Special thanks to Tom Shaughnessy, Viktor Bunin, and Jacob Blish for feedback.